Piano practice and homework fall into the same category. They are both necessary for success and they can be tedious and hard work. Kids prefer fun to hard work. Today’s kids, who are being raised in a culture which seems to put pleasure before business, can freak out when confronted with the reality of hard work. Another factor has to do with the secondary gain a child gets from an ongoing conflict like the one about piano practice. All kids crave parental attention. This is such an important need that they will settle for–or behave in a way to insure that they will get– negative attention. I also suspect that the more negative attention they get (even if they are getting positive attention too) the more they want it. Maybe they go for it because it’s so darned predictable. All I have to do to get Mommy’s attention is whine about piano practice and it happens every time! Disclaimer: I think music is important. So important that if I were Dictator of Education I would mandate that all children study a musical instrument. I support music lessons not just because children learn a new language and how to appreciate music but also because the children profit from the discipline of practice. (See ParenTip: Music Lessons) Thus my advice to Concerned Mother is to continue her son’s piano lessons. But I agree with her constant familial bickering is not healthy. So I suggested she set up a family meeting to tell her son there is going to be a big change in the way your family works from now on because he is growing up and can learn to take responsibility for some things himself. This big change will start with a CONTRACT that you both will sign. 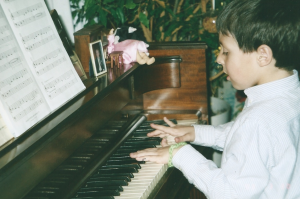 The contract calls for 30 minutes of piano practice 6 days a week (every endeavor needs a Sabbath) without any reminders or nagging from Mom who also signs and obeys the terms of the contract. If the boy does not practice on his own without being reminded, there will be a CONSEQUENCE like no TV that night. Contracts should be written by the parent and the child together so the child has a sense of ownership. The long-range goal is that children remind THEMSELVES of their responsibilities. When they become too big for Mom to remind them but are not quite ready to remind themselves, a contract is an intermediate step. The hard part is for the parent to quietly and dispassionately enforce consequences EVERY TIME the kids don’t live up to the contract. This is the way the real world works so children have to learn it sooner or later. The good news is that, though there will be grumbling and whining in the beginning to test you, once your son realizes you mean what you say there’s no longer any point in whining. You are not the practice ogre–it’s the contract.